What is gingivitis gum disease? 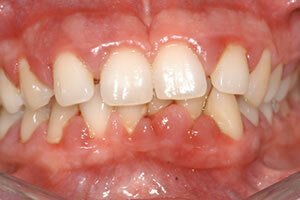 What is periodontitis gum disease? 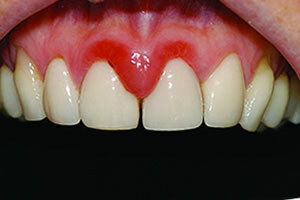 Is there a cure for periodontitis? What is a periodontist dentist? Boota is an extremely skilled periodontist and sedation dentist. Leading a select team of experts devoted to delivering excellence in periodontics and implantology at the practice in Birmingham, he has a reputation for routinely surpassing patient’s expectations. What is the definition of a periodontist dentist? In order to define Periodontology or Periodontics (from Greek peri “around” and odontos “tooth”) is the speciality of dentistry that studies supporting structures of teeth, diseases, and conditions that affect them. The definition of the supporting tissues are the periodontium, which includes the gingiva (gums), alveolar bone, cementum, and the periodontal ligament. To define therefore; this is a professional who practises in this special field of dentistry who has additional training and qualifications. The British Society of periodontology exists to promote the art and science of periodontology. Their membership includes specialist practitioners, periodontists, general dentists, consultants and trainees in restorative dentistry, clinical academics, dental hygienists and therapists, specialist trainees in periodontology and many others. You are welcome to independently check my credentials. I qualified from Liverpool University in 1992 and worked in the Wirral area, Merseyside for 12 months as a vocational general dental practitioner. Then I came back to my home city of Birmingham where I worked inner city area for a further 18 months in a large general dental practice. This exposed myelf to huge amount of dental disease and in particular gum disease. I was astonished to find out that in UK’s second city with a population over 1 million that there was no Specialist Periodontist in Birmingham. The nearest practice offering this type of gum therapy and implants was in Leicester which is over 45 miles away. Comparing this San Francisco which has a similar population, there is over 200 Periodontists in that area alone. This lead me to start a training programme in both dental implant implantology and also a Masters degree at Liverpool University. After completing a Master’s degree in Periodontology in 1997, I then lectured in the periodontal department at Liverpool University from 1998 till 2000 part time. In 2000 I was awarded membership of the Restorative Dentistry faculty of the Royal College of Surgeons (England) after passing the exams and in the same year was entered onto the General Dental Council’s Specialist Register in Periodontics. 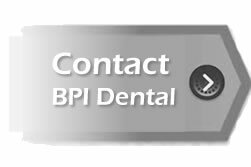 Since 1996 I have taking referrals for periodontal and implant therapy. I started in Harborne in 1997 and have been here since that date. After almost 17 years since I started my training and I am still the only Full time Specialist Periodontist in the City of Birmingham and surrounding areas ! In addition to my role as Principal of Birmingham Peridontal and Implant Centre, I have also taught part-time at the Birmingham University Dental School. Since then I lectured extensively in the UK and Europe on Periodontology and Dental implantology. This could include any of the following, instruction in plaque control, scaling and root surface debridement, bacterial analysis and antimicrobial therapy, occlusal analysis and adjustment and splinting of teeth. The patient’s response to non-surgical therapy is closely monitored; if periodontal problems persist further treatment may be required. 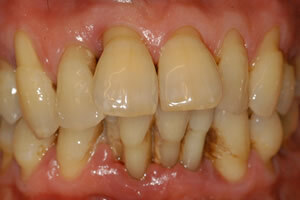 This gentleman has severe gum problems caused by neglect and also medication for his high blood pressure. 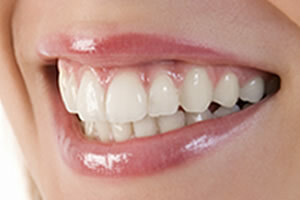 After undergoing a course of gum treatment, the swelling and bleeding was completely eliminated. His teeth were much more comfortable and felt his breath was much fresher. The long term outcome is very good with good flossing and brushing. After treatment the periodontal condition has been stabilised with just non-surgical therapy and has been maintained by excellent plaque control by the patient. Problems such as excessive recession around teeth that cause aesthetic and sensitivity problems can now be dealt with great success. The use of soft tissue grafts can increase the zone of keratinised tissue and cover exposed roots. They can also be used for ridge augmentation and papilla regeneration around implants. The use of microsurgical techniques has greatly enhanced the predictability and success rate whilst also minimising post-operative discomfort. Surgical periodontal and regenerative therapy. This is usually performed if there are still problem areas after non-surgical therapy. Various surgical techniques are used for pocket elimination and predictable regenerative therapy using the latest materials available. Non-responding sites that after root surface debridement still have deep pocketing and bleeding on deep probing. Pocket reduction periodontal surgery was carried out resulting in minimal probing depths and no bleeding on deep probing. 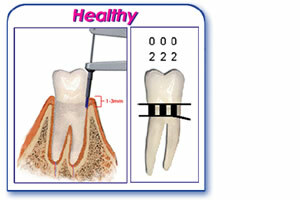 This also provides the patient with proper access for plaque control in home maintenance. Advanced bone loss on the distal surface of the premolars. Surgical regenerative therapy was carried out using Emdogain bone regenerative material. Bone regenerative therapy establishes new tooth support through new bone growth thereby enhancing the long-term prognosis of the tooth. 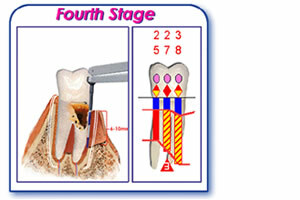 Often multi-rooted teeth have a localised infection around one root. 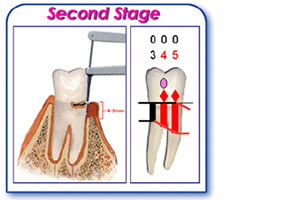 This surgical procedure is used to remove an infected root or to divide a two rooted tooth. The tooth remains functional because the infection is eliminated making it possible to perform effective plaque control and keep the site healthy. Extensive bone loss and failed root filling around the distal root of the molar. The mesial root was found to be sound. The distal root has been removed and the mesial root retained. The mesial root will be subsequently restored by the referring dentist. 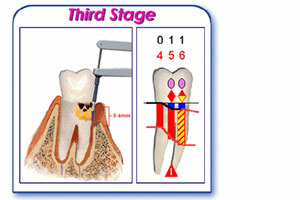 Short and inadequate tooth length prevents the placement and retention of a new crown or bridge. This procedure increases the amount of tooth structure to support a crown or bridge by contouring the gingiva and the underlying bone. In addition it can also be used to improve the appearance of the anterior teeth prior to any advanced dental treatment or by removing excess gum tissue in the case of a “gummy” smile. A tooth fracture with inadequate tooth structure for crown retention. After crown-lengthening procedure was carried out additional tooth is available to provide successful placement of a crown. After the procedure you can see a full coverage crown that is more retentive and natural looking. Short teeth and a gummy smile that compromises the aesthetic appearance of the smile. After aesthetic periodontal surgery the gums were positioned in a more pleasing position and contour. The beauty of this smile was completed with new porcelain veneers. How is periodontal disease diagnosed? What are gum pockets? There are few if any early warning signs, but as the disease progresses, the signs and symptoms become more obvious. Dental research continues to solidify the link between periodontal (gum) disease and your overall health. Although periodontal disease is often difficult to detect in the early stages without a periodontal exam, it can be very easy and painless to treat. If not treated in a timely manner, periodontal disease has been associated with an increased risk of heart disease, stroke, diabetes, and low birth-weight babies. We are excited to let our patients know that we utilize the Florida Probe® System as an advanced diagnostic tool for the tracking and monitoring of this disease. This system, which utilizes an automated, computerized probe, has proven to be more accurate and consistent than traditional methods of assessing periodontal disease and provides both you and the dental team with advanced information. Software automatically tracks good and bad changes in your periodontal health over time and creates a printable periodontal chart that visually illustrates these changes to enhance understanding. 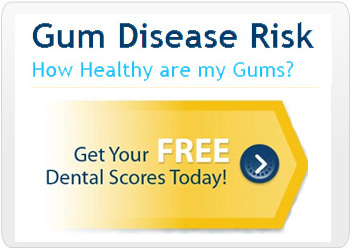 Their new Risk Assessment Screening tool calculates your risk of periodontal infection or re-infection based upon your specific risk factors, which include smoking habits, systemic health, oral hygiene, medications you may be taking, genetics, age and other contributing factors. You are assigned a high, medium, or low risk score based on combining these risk factors and your periodontal exam data to date. You will leave with a clear picture of your gum health and a better understanding of your treatment options. Florida Probe®, helping to protect your beautiful smile for a lifetime! Do you have periodontal disease? The diagnosis? If left untreated, periodontal disease can lead to bleeding, discomfort, receding gums and tooth loss. More that 50% of Americans over 30 have some gingivitis and more than 33% (35 million) have periodontitis. Periodontal disease affects 3 out of 4 people at some point in life. Dental research had linked periodontal disease to and increase rate of heart disease, stroke, diabetes, respiratory disease and pre-term and low birth weight babies. 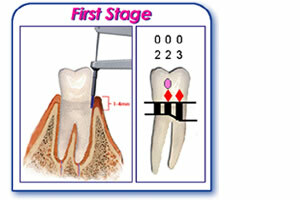 The Florida Probe has been designed has a high tech instrument used in the war against periodontal disease. Speak with your dentist about routine periodontal probing, maintenance of deep pockets and ways to improve your home care. Remember that early diagnosis is the key to maintaining your oral health and preventing serious systemic problems. 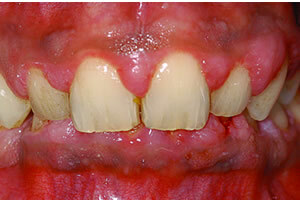 Is there a cure for gum disease periodontitis?